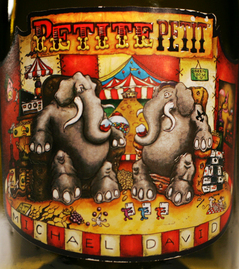 Michael David “Petite Petit,” 2007 Lodi | the wine snob. I’m suffering from something of a “wine whiplash” today- a term we cleverly invented last night to describe the drastic switch from all my delicate, refreshing summer white picks of the last few weeks to this week’s pick- the gargantuan behemoth of a wine that is Michael David’s ‘Petite Petit.’ A very cool blend of 85% Petite Sirah and 15% Petit Verdot from the Lodi region of California. This wine has been something of a showstopper for the last few weeks at Cellar and Mr. Friendly’s- we’re both pouring it by the glass, and it’s been one of our best retail sellers. Just last night a gentleman came in raving about his dinner at Mr. Friendly’s, and did we sell the wine he just drank? the one with the carnival on the front? I said, yes of course- $16 bottle- and fetched him a bottle. He paused… and then said- “On second thought, just give me a case.” Like I said- it’s popular. And with good reason- this thing has atomic-like levels of fruit, oak, spice, bacon- yes, bacon!- all up in it. Parker gave it 88 points- a reasonable score, but I think considering the fact that it’s so reasonably priced it deserved a 90. Just sayin’. On first whiff you get a massive hit of cloves, vanilla, a little hint of flowery-violets, and then- whoah! BACON! mmmmmmmm, yes- bacon in a glass. Does it get better than that? Juicy cherries, cedar, blackberries and maybe a bit of fig follow. Parker calls it a “civilized” Petite Sirah- a grape that is notorious for being too tannic and feral for it’s own good. It’s used as a blending grape in a lot of circumstances- especially with Zinfandel to tone down and tighten up it’s jammy quality. Here’s a better look at the image on the front of the bottle. 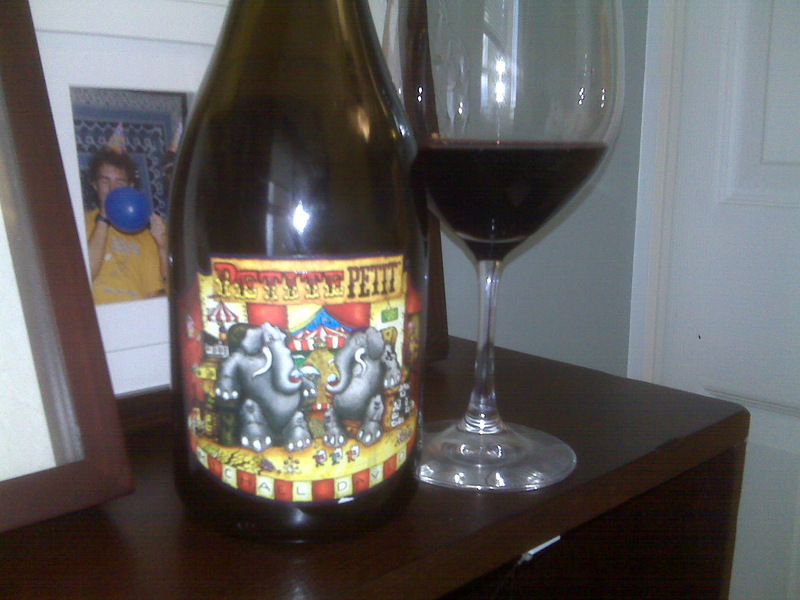 Elephants are a good choice for a graphic- this wine is big and burly like an elephant, but also smart and purposeful. Did I mention I love elephants? Always have. In conclusion, lest you think I do anything without a good reason- I didn’t switch up from my summer wine kick completely- this wine, although massive, is ALSO a great summer wine! Know why?! One word- BURGERS! Summertime means grilling out! And with the smokey bacony characteristic of this wine it would be absolutely SUBLIME with a burger. I even have a perfect burger, one that I devoured last night and thoroughly enjoyed… I don’t know the name of it, but it was from Pawley’s Front Porch and it was blackened with bacon and pimento cheese and it was heaven! And how convenient- you can place a take out order from Pawleys, run up to Cellar and pick up a bottle of Petite Petit, and then head home to feast on the couch. At least that’s what I would do. Just an idea. 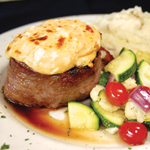 It would also taste pretty darn good with the famous Bacon Wrapped Filet with French Quarter Pimento Cheese from Mr. Friendly’s, just in case you thought I had forgotten my allegiances completely. Ask for Daniel. He will take good care of you. And if you’ve never had the oysters from Mr. F, (which would be shocking, to say the least) Daniel will make sure you get two different sauces on the side so you can decide which one you like better. (That was for you, Fomby). Well happy drinking, happy Spring, and happy grilling out! Enjoy the weather! Seacrest out. We tried some at the last Cellar wine sale and picked some up. Yummy good! Dan is always encouraging Carolyn to try PSs – and while she is sometimes cool towards this grape, Carolyn thinks this wine is a winner! And of course, the label is too cool. You’re awesome! You’re always drinking wines that are on my mind. We carry this at the shop as well, and it kills. It’s great to have wines like this that sell themselves (primarily due to the label) but also because of the juicy juice inside. Lovin’ me some Petite Petit. Cheers! We took this to a friend’s the other night and everyone loved it! Need to come in a get some more.